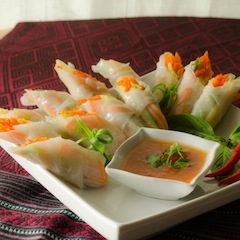 Fresh, crisp vegetables wrapped in rice paper. 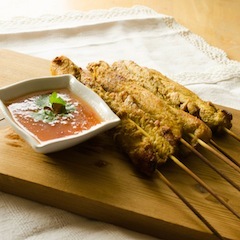 Served with peanut and spicy plum sauces. Marinated grilled chicken or tofu on skewers. Served with peanut and spicy plum sauces. 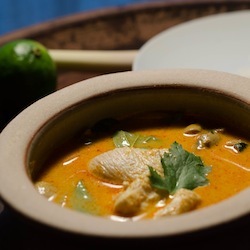 A Southeast Asian gem! Cocktail shrimp with Jun's mouth-watering special Thai dipping sauce. The real East meets West fare! Chef Jun's signature soup. Smooth and aromatic with herbs and a hint of coconut. An aromatic clear soup. Our national pride. A coconut lover's favorite. 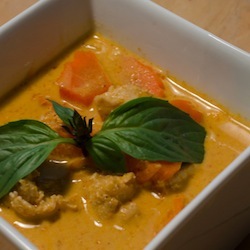 This soup is smooth yet mildly tangy and spicy with unique scent of galangal. This colorful dish is healthy and delicious. This grass noodle salad is tasty and refreshing. 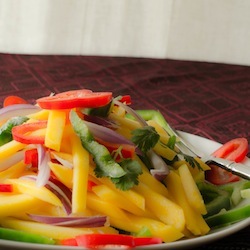 This flavorful papaya salad is a popular street food in Thailand. It will awaken all your taste buds. 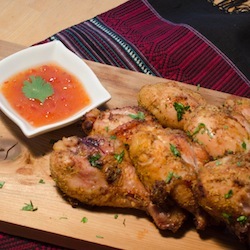 Chicken drumsticks marinated in Jun's secret lemongrass sauce. Great by itself or with spicy plum sauce. One of Jun's greatest hits. 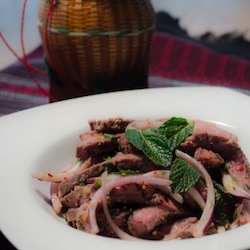 A perfect piece of steak topped with a Northeast Thai salad mix. Zesty and spicy. Highly delicious stir-fried noodle. 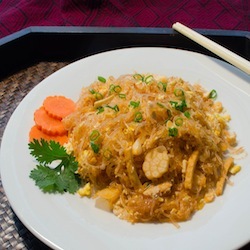 Arguably one of the most famous Thai food. Thick rice noodle pan fried with eggs and chinese brocolli. Jun's signature dish. Grass noodle with tofu, eggs, and garlic pickle. Our richest curry. Smooth as velvet... or in a Thai version, smooth as silk. Rated by CNN's Travel as the World's Most Delicious Food. Have you tried one? Don't let the green color deceives you. This dish is uniquely spiced up by green chillies. 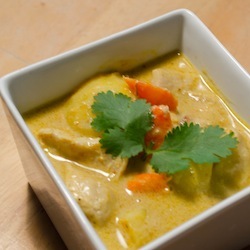 The real charm of this well-balanced curry is from the chiffonade of aromatic kaffirm lime leaves. A well-balanced stir-fried with mango and ginger, topped with crushy cashew nuts. One of Jun's proudest creations. A stir-fried dish with bold and spicy sauce. Jun created this one with love. 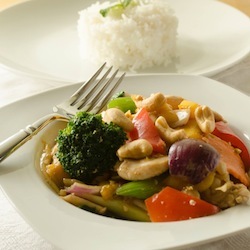 Delicious stir-fried chicken topped with cashew nuts. Thai's everyday food. Stir-fried meat of your choice with chilli and basil. 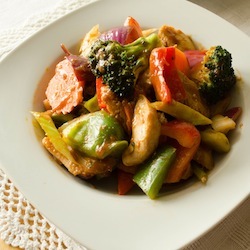 Yummy stir-fry with meat of your choice, fresh vegetables, and pineapple. © Copyright 2013. 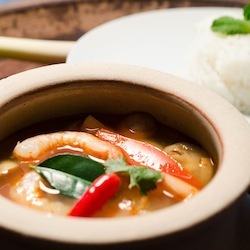 Lemongrass Thai Food. All Rights Reserved.